The first two wine pairings have been a really big hit. Let’s see what October holds for us. This time it’s going to be on a Wednesday, October 24 at 6:30 PM. We will be enjoying the night on the beautiful Pappagallo’s patio, where you can see the ocean and maybe even the moon. 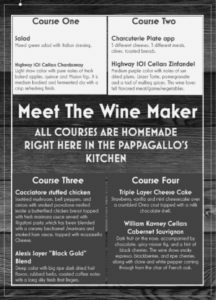 With having this event on the Patio, we have a limited amount of seats available so please call the restaurant, Pappagallo’s at 321.773.7272 and RSVP before we are sold out. Last time I checked it looks like we are a little more than half full for the October Wine Pairing Dinner. 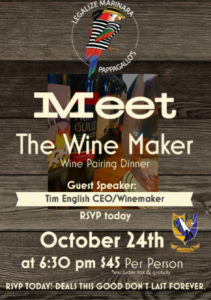 The theme is Meet the winemaker. Tim English the winemaker and CEO of the Vintage Selection Wine Company makes his own wines in California. He has great stories for every single wine chosen to go with each course. It is going to be a four course meal. There will be one white wine and three red wines. Each course is paired perfectly with a wine. The idea behind a wine pairing is for you to try the wine before you try your food. Then Drink the wine with your food and watch how the taste changes even enhances the wine and the food. Tim will be talking to the whole group about each wine. I have heard he is a great story teller. The whole night is a dance for the Pappagallo’s crew that will be serving you. From the kitchen to the wine/serving crew. We do our best to make sure not only that you have everything you need but that they wine comes out to your whole table at once and before the food comes out. Then the food comes to your whole table all at once. The Family Style tables adds a neat atmosphere. As an Italian family and restaurant this is how we do dinner. Everyone is welcome, meaning more than “Family.” During dinner “Friends” end up being Family. You may find that you are sitting with people you have never meet. We have found that 9 out of 10 times you meet some really neat people, have great conversation and maybe even make new friends. We will also have some items to raffle off during the desert course. We have a new way of doing it this time. It came to our attention at the last wine pairing that not only was it hard to hear the speaker but it was hard to hear the numbers being called out for the raffle. So we have purchased a speaker with a microphone. Of course we want everyone to hear the speaker and also hear their winning number being called. Mixed green salad with Italian dressing. Light straw color with pure notes of fresh baked apples, quince and Mission figs. It is medium bodied and fermented dry with a crisp refreshing finish. Medium purple color with notes of sun dried plums, Linzer Torte, pomegranate and a tad of mulling spices. This wine loves full flavored meat/game/vegetables. Sautéed mushroom, bell peppers, and onions with smoked provolone nestled inside a butterflied chicken breast topped with fresh marinara sauce served with Rigatoni pasta, which has been blended with a creamy bechamel /marinara and smoked ham sauce, topped with mozzarella Cheese. Deep color with big ripe dark dried fruit flavors, rubbed herbs, roasted coffee notes with a long silky finish that lingers. Strawberry, vanilla and mint cheesecake over a crumbled Oreo crust topped with a milk chocolate shell. Dark fruit on the nose, accompanied by chocolate, spicy mission fig, and a hint of black cherries. The wine shows smoky espresso, blackberries, and ripe cherries, along with clove and white pepper coming through from the char of French oak. Now that you know what the tables and event is like. 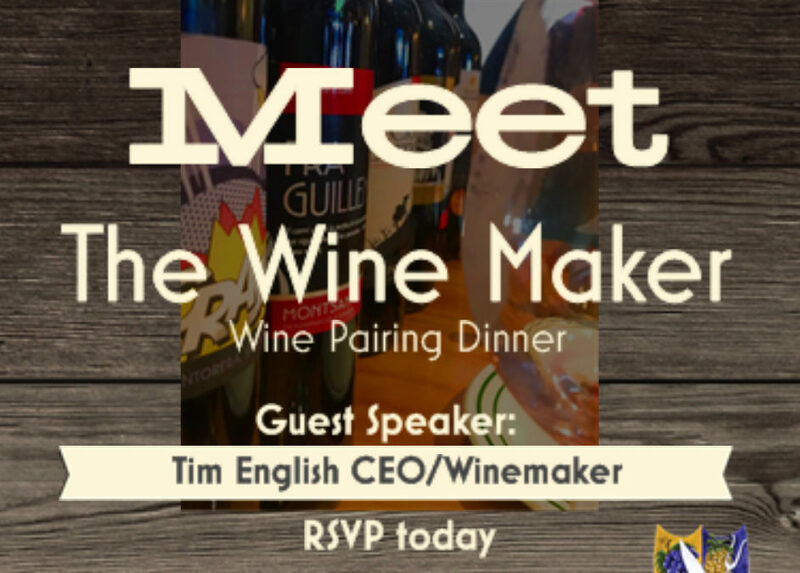 The first two speakers have come to the Crew and told them “how great the Family like atmosphere is at this event.” We hope that you come and enjoy a wine pairing night with us and have a similar experience. The cost is $45 each person this does not include tax or gratuity. The pre-selected wines and food that matches each choice allows our guests to experience a meal they may not have ordered if they were dining from our standard menu .